Paddle with the Orca whales, gaze in awe at 1000 year old cedars, savour the last moments of a sunset on a white shelled beach, hike in the ancient rainforests. All of these adventures are awaiting you off the coast of beautiful Vancouver Island, British Columbia, Canada. Come and join us! Adventuress is based in Parksville on the east coast of Vancouver Island and is open from February to October with lots of opportunities to kayak. So if the weather is fine and you feel like paddling, give us a call! Bring your friends, family, work associates or enjoy a paddle while your spouse is at the conference. Adventuress can plan a special trip just for your group. No kayaking experience is necessary. A gear list of what to wear and bring and directions to the launch location is sent upon registration. We also rent kayaks and do fun introductory lessons and full day certified kayaking courses for beginners. All tours include instruction, safety orientation, kayaks, Canadian Coast Guard regulation gear, dry bags for your camera, lunch and extra clothes and experienced, personable, certified guides. Spectacular scenery is free!! Woodlands, House, and Garden The garden is a sensuous delight. Old growth Douglas firs and cedars frame breathtaking views of the Strait of Georgia. The garden lawns slope gently to meet a precipitous bluff which plunges to the beach below. Beyond the strait, the Coast Range Mountains of the British Columbia mainland can be seen. To the north, Denman, Hornby, Lasqueti and Texada Islands are visible. The gabled house includes features of a Ceylonese tea plantation house. For example, each bedroom has a bathroom with a screened door leading into the garden. Its covered veranda looks out on both garden and sea views and serves as an outdoor room. Wisteria vines with soft, plump flower clusters cling to the walls. It is believed that the house was started in 1928 and completed in 1931. Bald eagles patrol the beach head and circle above their feeding grounds, their distinctive cries carrying across the forest. Blue herons fish the shore, while the dappled shade of the garden shelters songbirds. Purple finches and wrens nest in the camellias near the house. The garden features 500 varieties of rhododendrons, whose colours and textures grow against the majestic forest trees. Blue-green hostas, fragrant honeysuckle, and delicate lace-cape hydrangeas soothe the eye. The forest shelters wildlife. The significance and complexity of the estate go beyond this aesthetic richness, however. The property is located within the coastal Douglas-fir biogeoclimatic zone. These forests were dominated by towering Douglas fir, western red cedar, and Grand fir. Development and logging have taken their toll and very few old growth forests remain. The estate is one of a group of properties (totaling 140 acres) which comprise one of the last of such forests. As a result, the estate has a very high conservation value. The garden lies on the sheltered eastern shore of Vancouver Island and is protected from severe weather conditions sweeping in from the Pacific Ocean by Mt. Arrowsmith to the west. It is further protected by the mild Japanese current. Summers are warm and winters are mild. January temperatures average from 8-12 C. while July temperatures average 23-25 C. The average annual rainfall is 140 cm. Freely draining, sandy soil is a result of retreating glaciers which covered the area thousands of years ago. This soil is covered by a thin layer of forest loam typical of the region and supports a wide range of plants. Today the multi-layered forest canopy casts a dense shade over much of the garden area. The understory includes the extensive collection of rare rhododendrons as well as fine specimen trees. There are several formal areas with lawns and edge plants, a small orchard, berry and vegetable gardens. The garden includes specimens of Japanese maples, Davidia, Stewartia, beeches, laburnum, Katsura, dawn redwood, birches and Spanish chestnut. Of the total 28 hectare (70 acre) Milner Garden and Woodland property, 4 hectares (10 acres) is developed garden, 24 hectares (60 acres) is forest. The property includes a swimming pool and pool house, tennis court and cottage. COMMUNITY PARK Established in 1963, the waterfront Community Park is the jewel of Parksville. The park land is steeped in history; Parksville�s namesake, Nelson Parks, had a small shack near the land that currently makes up the Community Park. It is said that at a social event in his home, he remarked that it looked as though everyone around was present, so the settlement should be called "Parksville". To this day, the 39 acre Community Park lives up to its name and remains a gathering place and site for events and festivals. There is plenty of room on the beach for everyone and the park offers recreational facilities to satisfy the whole family. Waterfront Walkway In 2010 the City of Parksville completed a waterfront walkway from the Community Park to the foot of McMillan Street. The project was made possible by additional funding from the Province of British Columbia and a contribution from the Beach Club Resort. The boardwalk, as it is known, is ideal for convenient access to the vast sandy beaches of Parksville Bay, or for a beautiful sunset stroll on a summer evening. The boardwalk, which is 445 meters in length and 4.5 meters wide, accommodates pedestrians as well as wheelchairs and strollers. The multitude of dog-walkers, joggers, families, cyclists, skateboarders and people on rollerblades using the path each day illustrates the fact that the Community Park is truly a community meeting place for residents and visitors of all ages to enjoy. Concession and Washroom Facilities Near the Lion�s Venture Land Playground and Waterpark there is a concession facility where a variety of food and beverages can be purchased. The concession facility is not staffed by City employees. The facility is operated by an independent contractor renting the publically-owned building. There are two water fountains located in this area: one is the "lion�s head" directly in front of the water park and the other is located on the side of the concession building. The building is equipped with male, female and handicap-accessible washrooms which are maintained by City staff. Additional male and female washrooms are located near the ball diamonds. The City maintains an outdoor shower for washing off sandy feet at the end of a long day at the beach. Located on the waterfront side of the washroom and concession facility, the shower is only in use for the summer months. Horseshoe Pits If you�re looking to play an old-fashioned game of horseshoes, this is the spot! The City maintains eight horseshoe pits located near the picnic shelter in the Community Park. Users must supply their own horseshoes. Kite Field The kite field is a large green space located near the beach in the Community Park. 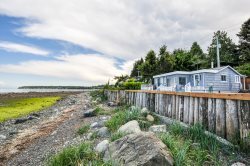 When the field isn�t occupied by major events like Kitefest, the Oceanside Overdrive Car Show, Kidfest or Parksville�s famous Canada Day celebrations, you�ll find people not only flying kites, but playing Frisbee or soccer, or simply sunbathing on the grass. Lacrosse Box An outdoor lacrosse box is located near the Community Park entrance. This facility is perfect for games of lacrosse or street hockey. Lion�s Venture Land Playground and Waterpark The Lion�s Venture Land Playground and Waterpark is definitely a landmark in Parksville�s Community Park. The Lions Club took over administration of the playground in 1985, adding the spray park in 1992. Children will love exploring the profusion of brightly coloured slides, swings and jungle gyms at Venture Land. Afterwards they can always cool off in the waterpark, complete with water cannons and a small waterslide! Parents can keep an eye on the kids from nearby picnic tables and benches or just spread a blanket on the lush grass for a family picnic. Picnic Shelter and Gazebo There are two separate rentable facilities in the Community Park which are available for events ranging from fundraisers to family barbecues to weddings. The picnic shelter located near the sports field was rebuilt in 2011. The shelter is used for a wide variety of purposes, including dog clubs, children�s play groups, family reunions, and live musical events, among others. The waterfront gazebo provides a spectacular view of Parksville Bay and is a beautiful spot for weddings. The gazebo is also a lovely place to just sit and take in the view; you can see couples and families stroll along the boardwalk or watch beach volleyball players dive in the sand, all while enjoying the ocean breeze. Skateboard Park Parksville�s only skateboard park is located at the Community Park beside the volleyball courts. There are half pipes, boxes, rails and ramps for all skill levels, and it�s not unusual to see experienced skateboarders patiently co-existing with young children on bicycles. The park is used primarily for skateboarding and BMX biking. The use of helmets is recommended at all times for all users. Additional regulations are posted on-site at the skateboard park and all users are asked to follow "skate park etiquette". Sports Field and Ball Diamonds There are two baseball diamonds on the sports field. The sports field is used for soccer, croquet, ultimate Frisbee, football and other activities. Unorganized or "pick up" games do not require field bookings. Tennis There are two tennis courts located at the centre of the Community Park. The courts were resurfaced and painted in 2010 and court markings for pickleball were added to both courts in 2012. Volleyball The Community Park boasts several large sand beach volleyball courts. These courts are home to some of the largest youth and adult volleyball leagues, camps and tournaments in BC throughout the summer. The courts are also available for casual public use, although users must supply their own equipment, including nets. Majestic old growth trees, beautiful ocean sunsets and an inviting, wide sandy beach with campsites nestled amongst mature Douglas fir trees makes Rathtrevor Beach Provincial Park in Parksville one of the premier vacation destinations on Vancouver Island. At low tide the ocean recedes almost a kilometre, providing an ideal place for visitors of all ages to play in the sand and explore the shoreline. When the tide rolls in over the sun-baked sand, the warmed water is unbeatable for swimming and salt water fun. Rathtrevor Beach is ideal for a relaxed family outing. Simply sit back and soak up the seaside atmosphere or take a walk through the wooded upland area of the park. All campsites are within a 5-minute walk to the 2 km stretch of sandy beach. The park also features a large day-use area, perfect for an afternoon picnic. For your convenience, the park has a concession managed by the Park Facility Operator. Bird watching is also a popular activity at the park, particularly in the spring when large numbers of seabirds congregate for the annual herring spawn. During March and April, Rathtrevor Beach is also one of the best spots on the Island to view the migrating Brant geese. Qualicum Beach Farmers Market - 20th Anniversary Year! Sart your Saturday with a visit to Qualicum`s Farmer`s market at Memorial and Veteran`s Way. Here you`ll find the best in fresh fruits, vegetables and berries, plants and cut flowers, fresh baked goods, jams and jellies, fish, chicken and pork, as well as a wide range of local crafts.
" Situated along the pristine Englishman River north of Nanaimo, Englishman River Falls Provincial Park features two stunning waterfalls cascading along the descending riverbed into a deep canyon. This picturesque destination, set amid a lush old-growth and second-growth forest of Douglas fir, cedar, hemlock and maple, is an ideal location from which to explore and appreciate the incredible diversity of south central Vancouver Island, including nearby Cathedral Grove, the Pacific Rim, and the sandy shores of Parksville and Qualicum. The park has a large day-use area and campground and contains several hiking trails that meander through the forest and along the river. Visitors can expect spectacular views along the way, particularly from two bridges that cross the river where it plunges down the narrow rock canyon toward quieter waters below. The lower falls end in a deep crystal-clear pool � an ideal swimming hole in the summer when river levels are low and a great place to view spawning salmon in the fall." Art in a Heritage Schoolhouse "The focal point of the arts community is the Old School House Arts Centre (122 Fern Rd. West near Qualicum Foods). Masterfully restored, the 1914 schoolhouse (known locally as TOSH) is now home to resident painters, silversmiths, potters, photographers and other fine artists who work in open-door studios. Ask questions! They`re happy to chat about their art"